I had planned to spend my Thanksgiving holiday with a friend in Calistoga, walking and talking, tasting wine, maybe even having a mud bath for the first time. However, Life (at this time it seems appropriate to give her a capital letter) got in the way. So instead of hanging out and relaxing, I'm sitting in the airport on my way to Portland. My 87-year old father is in the hospital, and I need to go help my mother. However, after my initial self-pity and grumbling, I've decided to think of this as an opportunity to stop every day to reflect on something I can thankful for. 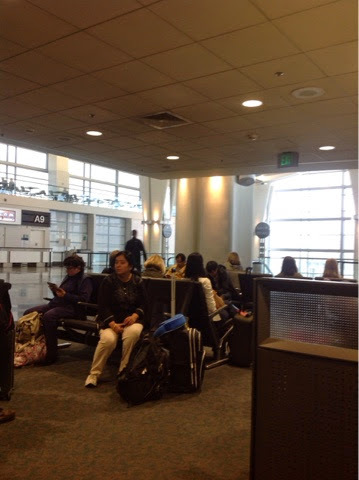 After all, I'm sitting here at SFO surrounded by travelers going off for their own Thanksgiving holidays. I will get to see my family. That's a good thing. It's been over a month since I posted to this blog, so this time between security screening and boarding gives me time to reflect. And I realized how this small moment has given me something. Won't you stop at least once during this busy day and notice the goodness around you?